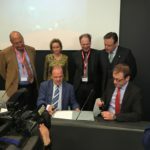 On March 23 the Flemish government’s ambitious moonshot programme was launched by Flemish Minister of Economy and Innovation, Philippe Muyters. The 400-million-euro programme for the next 20 years will help position Flanders as a leader in research and innovation for energy-intensive industries. We invite you to find out more about the moonshot programme, its goals, what we and our partners will achieve, and what the next steps will be, at our Catalisti day on June 6, from 9.30 AM to 6 PM! You do not want to miss the presentation on how to “Enable the Flemish industry to transition towards a carbon circular and low-carbon system in 2050”. The Catalisti day has much more in store for you. In addition to the moonshot, it is all about ‘Accelerating Innovation into Business’. Learn how Catalisti catalyses collaboration between industry and knowledge institutes to enable sustainable innovation. Discover testimonials from innovation project champions. Hear candidates defend project proposals in the Battle of the Pitches. Network with your peers to share ideas and experiences. More information on the event will follow soon. Click this button to block the date in your agenda now!